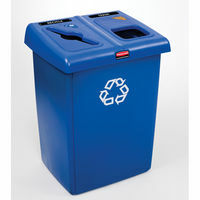 The Rubbermaid 1792339 2-Stream Glutton Recycling Station Comes In Blue Only. 46 gallon recycling station capable of separating up to 2 waste streams. 46 gallon centralized capacity provides sortation and containment for up to 2 separate material streams. Multiple restrictive-opening hole shapes and various color coded iconic and/or word labels provide flexibility, and help minimize contamination by giving visual cues for material identification. Fully integrated station gives credibility to building recycling program and drives recycling compliance. Unit comes complete with 1 Glutton® Receptacle, 2 Slim Jim® Receptacles, 1 lid frame, choice of 3 opening shapes (circle, slot, square), and label pack.